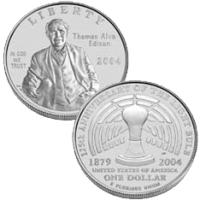 Celebrating one of the most prolific inventors in history, the US Mint issued the 2004-P Thomas Alva Edison Commemorative Uncirculated Silver Dollar early in 2004. The coin was actually struck to commemorate the 125th anniversary of Edison’s creation of the light bulb, but the man as well as his many inventions were also honored. Surcharges added to the sale of these coins were forwarded to eight different organizations in some way affiliated with the memory of Edison or his contributions to society. Edison Silver Dollars were produced in both proof and uncirculated condition by the US Mint. The US Mint is not required to strike commemoratives each year, but instead are directed to do coins on an individual basis based on legislation authorizing each coin. Each Edison Silver Dollar is struck from 90% silver and features a diameter of 1.5 inches. 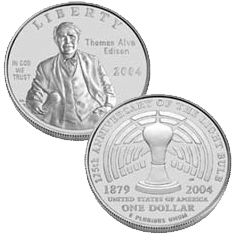 The Uncirculated Edison Coin was released on February 11, 2004. $31.00 is the initial issue price shown for the Edison Uncirculated Coins from the US Mint. Each Edison Silver Dollar was struck at the US Mint’s facility in Philadelphia and show the ‘P’ mintmark. Designed by United States Mint sculptor/engraver Donna Weaver, the obverse (heads side) of the Thomas Alva Edison Silver Dollar features a portrait of the famous inventor in his laboratory. Edison’s 1879 light bulb is shown on the reverse (tails side) of the coin and was designed by United States Mint sculptor/engraver John Mercanti.